Delivery of the rented vehicle at your hotel. Departure through urban and rural areas with beautiful landscapes to arrive in Santa Cruz de Turrialba. 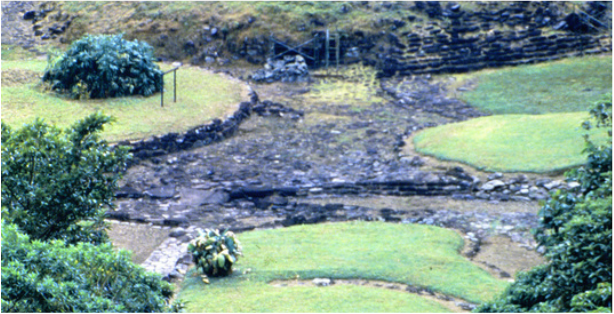 Guayabo’s architectural structures were built in central Costa Rica in 800-1550 AD. However, archaeologists have found ceramic evidence of earlier occupations from around 1000 BC. Declared World Engineering Heritage due to its impressive water system, the site is surrounded by a 210ha (519 acres) evergreen forest. Later, near the city of Turrialba, visit CATIE, the Tropical Research Agronomic Center. Opportunity to walk through natural forest trails and to visit a tropical exotic fruit garden. Drive through a picturesque narrow road to Siquirres and continue to Liverpool town. The park at Veragua is a buffer zone for La Amistad International Park. Admire the serpentarium and the only existing natural frog garden in Latin America. Take the funicular into the jungle and stroll along the skywalk enjoying pure life at its best. The butterfly garden is also one of the largest in the country, comprising most of the Caribbean species. Continuation passing near the city of Limón and then through the Coastal Caribbean Road to arrive in Cahuita. In the morning, visit to Cahuita, one of the most beautiful palm tree beaches. The white sand derives from crushed coral and shells and is lighter than the normal stone sand. 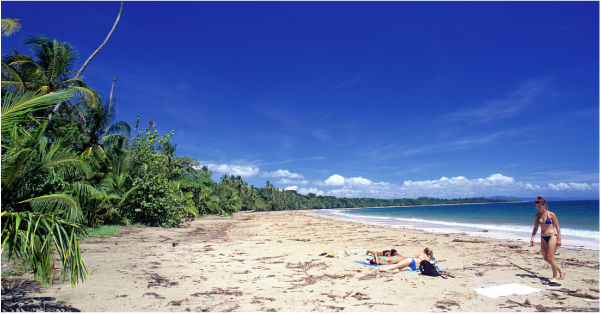 In the National Park, admire the beach, the crustaceans and fishes and also the only “living” coral reef in the Costa Rican Caribbean Coast. Midday departure to visit the Sloth Sanctuary and continuation by the city of Guápiles on the way to the Sarapiquí Area. Early morning visit to Selva Verde private reserve. At midmorning, short drive to arrive at the river embarking point. Boat tour to observe the great natural richness of the area, to watch a wide variety of animals, including monkeys, beautiful birds, iguanas, lazy crocodiles, river turtles, and many more. Later, continuation across the fertile San Carlos lowlands to arrive in La Fortuna in the Arenal Volcano Area. After sleeping quietly for more than 400 years, the Arenal volcano erupted with tremendous force in July 1968. The almost perfect cone, at 1.633m above sea level, has a 140m deep crater formed over an ancient caldera. Visit the Hanging Bridges. Enjoy the walk into a dense rain forest. From the highest suspension bridges admire the forest canopy in the Arenal Volcano area, a natural corridor of great biological diversity followed by birds migrating between North and South America, hundreds of flowers and the lush vegetation of the primary rainforest. Early evening, relax in the hot springs, a nice resort with natural thermo-mineral water swimming pools, waterfalls and exotic ecological gardens.